So, you have installed your patio paving using the high-quality natural stone pavers looking gorgeous. Now, one year has passed, and it started getting dreadful due to unwanted growth of weeds. You might wonder how weeds emerged instantaneously in your garden paths, patio pavers, or driveways. If you have a look closely to bricks or stones in your patio, which has crevice in between the pieces. Of course, these services are responsible for the formation of simple to fascinating designs at one hand. The same also become the cause of harboring notorious weeds infestations. Dispersion of weeds may take place through any route, but seeds are certainly coming from your vicinity, be it your garden or from the neighborhood. Unfortunately, we are helpless to stop the dispersion of seeds of weeds, but certainly can stop its growth and remove sprouted seeds or already grown weeds. The first thing should first. 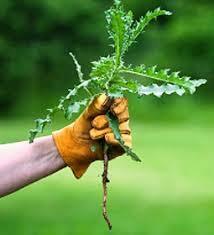 You have to remove the already grown weeds first and think of its preventions later. Let’s get some good clues in due course. It is true that picking weeds by hands demands exhaustive endeavors and some investment of tools. You have to wear the hand/garden gloves. It is because you have to work with damp soil. 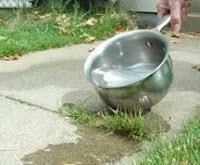 Dampening of soil is essential to ease the picking the weed plants right from the roots and pool those up easily. You must follow the tips given below. Select tight fitting garden gloves to get a good grip. Garden gloves save your hands from being dirty by wetted soil and hazardous living organisms residing in the damp soil. 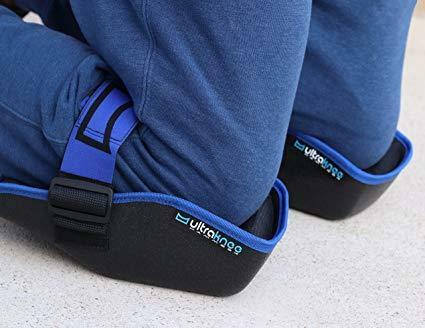 Select comfortable knee pads to wear because you have to bend down for longer, and knee pads will save you from being dirty your clothes as well as any injury or insect bite. 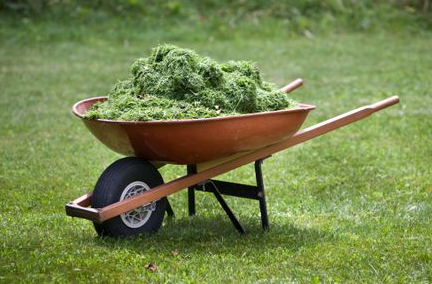 Keep a moving trolley or dustbin to collect the weed along with picking up the process, so you have enough resting period in between the monotonous picking process. Use billhook or crack weeder for wider cracks and a serrated kitchen knife for narrow cracks to pull up weeds right from the roots. 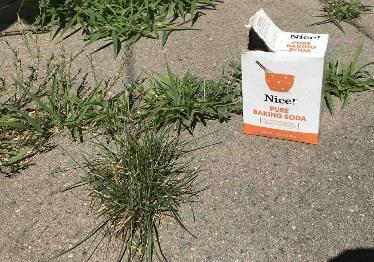 If you prefer green/environmentally safe ways to remove weeds from your backyard or garden patio, to follow are time-tested natural remedies those work at far cheaper rates. Baking soda is chemically known as Sodium Bicarbonate. Technically, it overloads weed with salts and absorbs cellular water from the tissues of weed. Eventually, roots of weed dry out, and it dies. Vinegar, just like Baking Soda is chemically acetic acid. Technically, it draws the moisture out of the plant tissues including roots and leads the plant to death within a day or two. Common Salt is chemically Sodium Chloride. 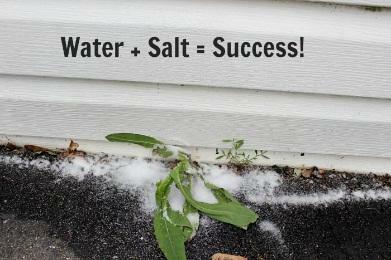 When it used as oversaturated solution in 3:1 (Salt-:-Water) ratio, it dehydrates any plant including weeds of your pavers. 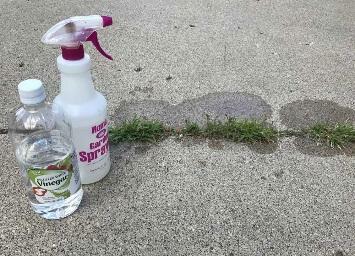 Repeat the process monthly until new sprouting of weeds stops. 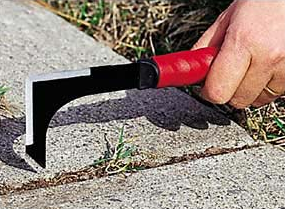 It is an extremely inexpensive and simple way to kill the weed plants growing in cracks of the patio paving or garden paths. The best way is to apply grass cutter machine before boiling water treatment. It will open up the crown of the weed plants and provide space to hot drip water into the deep soil. Using fire flames to burn the weed plants is an instant remedy for centuries. It demands extreme precautions when applied in an open space. Avoid usage near storage area, wooden parts of building, useful plants in nearby, and keep your clothes, kids, and other dry plants away while using it. Today, many herbicides or weedicides available in the market, which are safe to apply at different stages of weed growth. For example, pre and post emergence stages of weed growth. 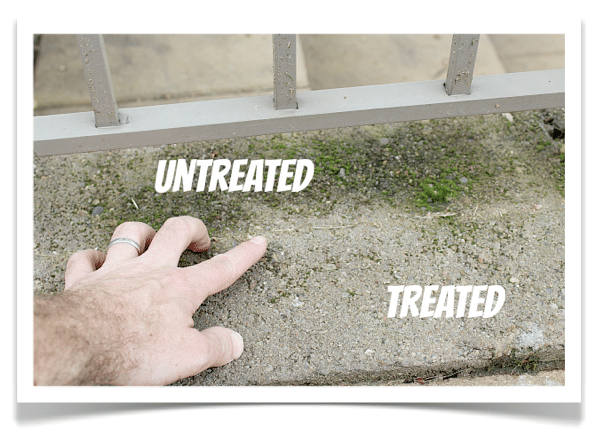 Pre-emergent weedicides are preventing the sprouting/germination of seeds of various weeds hidden in between the soil of patio stone cracks. It kills the key enzymes causing sprouting in seeds. Post-germination weedicides are killing the weed plants right after the germinating or any stage of their lifecycle when applied in right concentration. Most of the post-sprouting herbicides acting on a specific genre of weed plants. Selective types of herbicides act on the only specific genre of weed plants. It inhibits the sprouting of seeds at the pre-emergent stage. Similarly, it kills the weeds at the post-emergent stage. Nonselective types of herbicide can kill any plant, whether it is a weed or useful plant in your garden grown nearby your patio pavement or path. Therefore, use it carefully for patios, sidewalk, and driveways. As its name suggests, it acts only when it comes into the contact of any part of weed plant. It kills weeds immediately and dangerous while spraying in a residential area where the wind blows high or kids are playing around. As its name suggests, it absorbed by the weed plants when spraying on any parts or tissues of the plant. It is dispersing in the entire internal system of the plant including roots, stems, branches, and leaves and disturb the key enzymatic processes within the plant and kill it gradually. 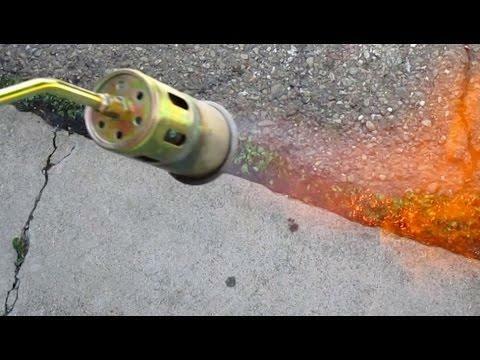 It is completely safe when applied carefully in residential areas. In the old days, patio owners were removing old contaminated sands from cracks between the stones of paving patios. They used to fill up the crevices with new or fresh sands. Unfortunately, it alleviated weed growth only for limited period or seasons. It proves expensive when carried out frequently within a short span. Fortunately, today we have the latest technologies called artificial sand granules made from polymeric chemicals. It binds or glues the sand particles after activation by water. 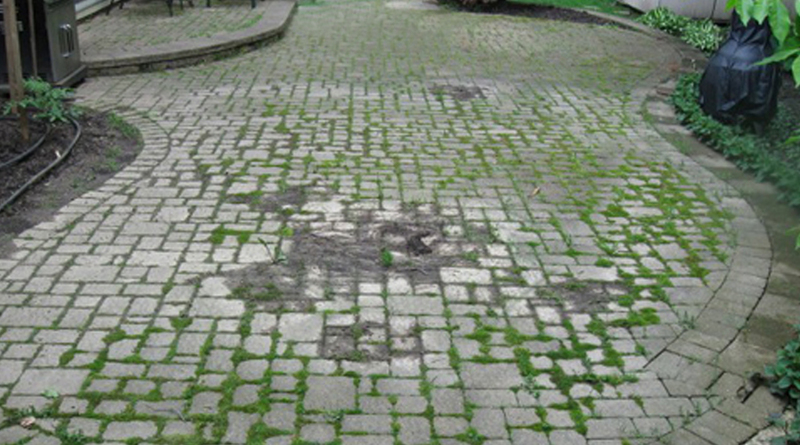 Upon drying, it gets hard and cements the stones in pavers to prevent invasion of seeds of weeds. The prevention mechanism of polymeric sand is as follows. EnviroSand is a known brand in polymeric sand manufacturers. It has plant glue, which converts into a gel when wetted with water. The gel prevents washout of sands and acts as the first line of defense to stop weed growth. It also has high pH, which ultimately inhibits future growth of seeds and plant sprouts. How World of Stones Helps You to Prevent Weed Growth between Paving Stones. At ‘World of Stones’ and its worldwide branches. We are selling stones or building materials of high quality that can withstand in any weather condition. 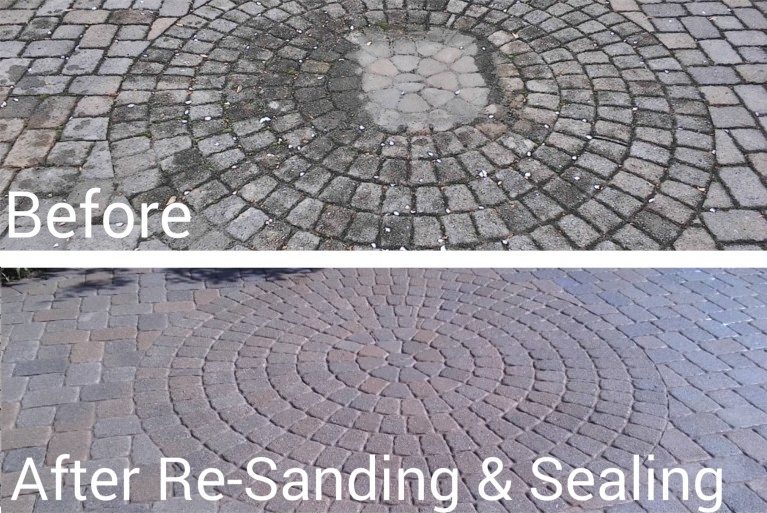 Our stones can bear the natural or chemical treatments you give to prevent weed growth between interior & exterior paving stones of your patios. We also take care of other aspects of our products and their consumption. It means we are providing consulting services to guide your installation, maintenance, and replacements of various stones like round stepping stones, Natural paving patio, steps and many other products. If you want to join your name on the list of our loyal patrons and leverage our outstanding offerings, we welcome you warm-heartedly. It is crazy that you can even put in driveway pavers so tight that weeds cannot grow. My wife and I have been talking about having driveway paver services install a paver driveway at our place. We like how it looks and makes the house look luxurious. this write-up and the rest of the blog is also really good.